In October 1991 Apple released the first three PowerBooks: the low-end PowerBook 100, the more powerful PowerBook 140, and the high end PowerBook 170, the only one with an active matrix display. In 1992 Apple released a hybrid portable/desktop computer, the PowerBook Duo, continuing to streamline the subnotebook features introduced with the PowerBook 100. The Duos were a series of very thin and lightweight laptops with a minimum of features, which could be inserted into a docking station to provide the system with extra video memory, storage space, connectors, and could be connected to a monitor. Despite being seen on Seinfeld, the model did not sell as well as expected, although several companies have since adapted the design. Both the 100 & 200 series PowerBooks were intended to tie into the rest of the Apple desktop products utilizing the corporate Snow White design language incorporated into all product designs since 1986. However, unlike the Macintosh Portable which was essentially a battery powered desktop in weight and size, the light colors and decorative recessed lines did not seem appropriate for the scaled down designs. In addition to adopting the darker grey colour scheme which co-ordinated with the official corporate look, they also adopted a raised series of ridges mimicking the indented lines on the desktops. The innovative look not only unified their entire product line, but set Apple apart in the marketplace and had the added benefit of masking fingerprints while the ridges provided added traction with which to grip the PowerBook. These early series would be the last to utilize the aging Snow White look, with the 190 adopting a new look along with the introduction of the 500 series. The original PowerBook 100, 140, and 170 were replaced by the 145 (updated to the 145B in 1993), 160, and 180 in 1992, with the 160 and 180 having video output allowing them to drive an external monitor. The PowerBook 180 had a superb-for-the-time active-matrix grayscale display, making it popular. 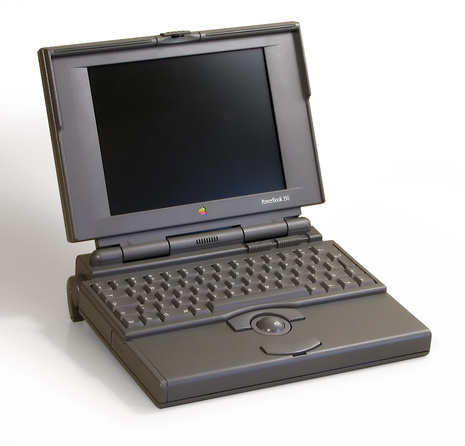 In 1993, the PowerBook 165c was the first PowerBook with a color screen, later followed by the 180c. In 1994, the last true member of the 100-series form factor introduced was the PowerBook 150, targeted at value-minded consumers and students. The PowerBook 190, released in 1995, bears no resemblance to the rest of the PowerBook 100 series, and is in fact simply a Motorola 68LC040-based version of the PowerBook 5300, and the last PowerBook model to be manufactured using a Motorola 68k-family processor). However, like the 190, the 150 also used used the 5300 IDE-based logic-board architecture. From the 100's 68000 processor, to the 190's 68LC040 processor, the 100 series PowerBooks span the entire Apple 68K line, with the 190 even upgradable to a PowerPC processor. The PowerBook Duo spanned the 68030 line of processors and sold through the PowerPC transition to the G3 processor with the 2300, also based on the 5300's internal architecture. The original three models were the PowerBook 100 (16 MHz 68HC000), PowerBook 140 (16 MHz 68030), and the PowerBook 170 (25 MHz 68030). The 100 and 140 had passive-matrix 1 bit screens, and the 170 had a 1 bit active matrix screen. The passive matrix screens are a bit more blotchy and more susceptible to stuck and dead pixels. Active matrix screens are much brighter, and tend to be clearer and nicer to look at. In the years to come, Apple would release other 68030-based PowerBooks: 145, 145b, 160, 165, 165c, 180, 180c, and 150.